More story here with other convention news links. We are winding down. Convention is over, but I am here in Texas for another day. The weather is hot but the vibe is cool. 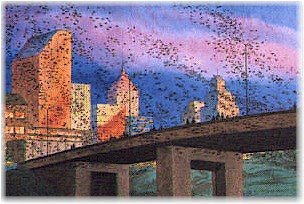 The Congress Avenue bridge in downtown Austin is the spring and summer home to some 750,000 bats with up to 1.5 million bats at the peak of the bat-watching season. It's the largest urban bat colony in North America. While bats have called Austin home for many years, it was after renovations to the Congress Avenue bridge over Town Lake in 1980 that they found their favorite hang out. Narrow but deep openings created in the bridge turned out to be perfect accommodations. Each evening around sunset the Congress Avenue bats emerge like a black cloud from the crevices of the bridge. Covering the countryside in search of food, it is estimated that the bats consume from 10,000 to 30,000 pounds of insects. Giving birth in June or July, the bats and pups hang around til October when they head back south. Watching the nightly forays for food is a favorite evening activity, especially in late summer. Although the Congress Avenue bats are in residence as early as March, the best bat views are in August when the young pups join their mothers in the nightly flights. It can take as long as 45 minutes for all the bats to exit the bridge. There are plenty of locations along Town Lake in the vicinity of Congress Avenue where you can watch the bats. Flights normally occur around 8 to 8:30 pm but could be earlier or later. Best bet, call the Bat Hotline at 416-5700 ext. 3636 for times. How cool is it, I ask you, that there is a Bat Hotline? Soon it will be time to get back in the fray, Fired Up! Ready To Go! But for tonight, there is just good friends, sparkling wine, and the time to reflect on a great week.